As a landscape plant, strawberry guava (also called cattley guava) has everything going for it - subtle beauty of form and foliage, beautifully patterned bark, and delicious fruit. 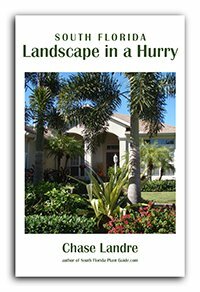 Need a large shrub to plant right next to the house? This plant is the ideal choice. Because of this plant's shallow root system, it works perfectly near the house as an architectural accent, shade for a too-sunny window, or as a wildlife attractor. Placement outside a large window is an ideal spot. There it has wonderful entertainment value (for kids and adults alike) as birds, squirrels and racoons stop by to feast on the fruit. Little white flowers appear in spring, followed by berry clusters that ripen in summer. When the berries reach a deep cherry red color they're ready to eat, with a sweet/tart strawberry-like flavor. If you want some, though, you'll have to pay close attention or the birds, critters and fruit flies may beat you to it. You can pick the fruit before it's completely ripe and bring it indoors to ripen. The attractive foliage is somewhat open, revealing the beautifully patterned bark with soft orange-brown and light brown mottling on the trunk and branches. This shrub can also be grown as a small tree, but it's important to keep grass away from the base since weed eaters and lawn mowers can cause injury to the trunk. Its size makes it a good choice as a tree for small yards. Trimming the base to keep it tree-like will also show off the unusual, showy bark. 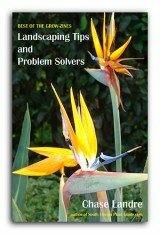 A unique ebook about low-maintenance plants and landscaping! Though strawberry guava is great for use in edible landscaping or as a wildlife food source, the handsome look of the plant itself makes it an attractive addition to any style landscaping. WARNING: Guavas are considered invasive, so avoid planting near a natural habitat like a preserve, where birds can spread the seeds. 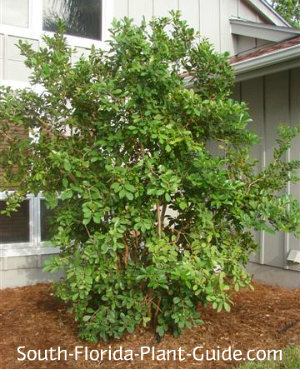 This evergreen shrub is a moderate grower and prefers a full to partial sun location. It can be kept trimmed to about 8 feet or you can let it grow larger. Though they can get 15 or 20 feet, these plants - especially when grown out in the yard - should be kept to a maximum of about 12 feet in height. Since their root system is shallow, too-tall guavas could be toppled by strong winds. Strawberry guava is cold hardy, fine in Zone 9B or anywhere in Zone 10. Add composted cow manure and either top soil or organic peat humus to the hole when you plant. These guavas grow with a naturally pretty form so you'll rarely need to do much trimming. Tipping branches will promote bushier growth if you want to do so. Trim off any branches that grow against the house. Prune for size in fall after fruiting season is over. Some say the fruit is messy - but many claim the squirrels and birds eat it before it ever hits the ground. To be on the safe side, avoid placement right next to paved areas. This plant is moderately drought tolerant once established but does best (and produces more fruit) with regular irrigation that allows time for the plant to dry out a bit between waterings. Fertilize 3 times a year - spring, summer and fall - with a quality granular citrus fertilizer. If planting a row of these shrubs, place them 4 to 6 feet apart. 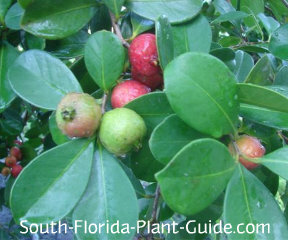 You can plant strawberry guava as close to the house as 4 or 5 feet. Situate it so branches aren't touching the structure. For a small tree in the yard, come away from the house about 6 feet or more. Along a walkway come in 5 feet or more to allow foot traffic to pass by as the plant matures. This will also help alleviate berries on the walk. These shrubs will work in large containers. GOOD SNOWBIRD PLANT? YES - though you'll miss the fruiting season. 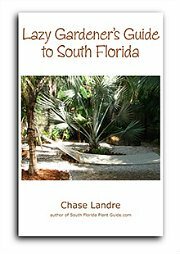 COMPANION PLANT SUGGESTIONS: Cocoplum, dwarf firebush, ruella, gold mound, carissa, Maui ixora, foxtail fern, and society garlic.